Tiger Woods started fast and then battled. It all added up to a respectable round in the end. The 42-year-old fired an even-par 71 on Thursday at the British Open to find himself five shots back of leader Kevin Kisner after 18 holes at Carnoustie. He reached the clubhouse in a tie for 33rd. It was a solid opening day for Woods, especially with this being his first British Open round in three years, although one can’t help but think it could’ve been a few better. One major after a disastrous triple bogey start, Woods played his opening hole to perfection at Carnoustie. An iron off the tee split the fairway, he knocked his approach to 8 feet and drained the putt for an opening birdie. Three holes later, Woods finessed his approach to 5 feet beyond the hole and coaxed in the birdie putt to move to 2 under. It was a fast start, and Woods was within three right away. As he encountered the middle of the front nine, it seemed the chance for an extremely hot start was there, too. After a flailed approach right, Woods nearly drained a 40-foot birdie putt from a valley right of the green – but the ball stopped one revolution short of dropping. The following hole, a par 5, Woods had just an 8-iron in for his second after a mammoth drive, but pulled his approach into a bunker and then whiffed on a 6-footer for birdie from there. Still, he managed a promising opening 2-under 34 after it all. But the conditions got windier and even more firm around that time, and Woods began to struggle with his game. A drive into a bunker at the 10th led to a bogey. Woods followed with a 25-foot birdie putt at the 11th but then made an ugly three-putt bogey from 25 feet at the 13th. He then scrambled for much of the remainder of the round. Woods tacked on a bogey at the 15th to fall to even par but made nice up and downs (draining a pair of putts in the 4-5 foot range) at the holes in between to avoid dropping more strokes. He also had to make a 4-footer at 17 for par. Woods followed with a par at the 18th as well. The 14-time major champion looked in control over the first several holes, but his ball-striking started to falter to a degree on the back nine. A couple of loose drives into bunkers came up, as did some lackluster approaches. His speed had been so good on the greens on the front nine, but Woods kept leaving putts woefully short on the backside. He missed a pair of short putts but had to drain so many others on the day because of comebackers he left himself. Considering the start, Woods’ final score on the day is a bit disappointing. But the conditions definitely got windier and tougher throughout the day. And in the end, he’s only five back heading into a second round (where he will get an earlier tee time). All in all, an up and down day – oh that started by the way with people concerned about the KT Tape he had on his neck when he arrived at the course. Woods iterated though that the tape was really a non-issue. It certainly didn’t seem to stop him at all during the round. And even with a tough finish, unlike the U.S. Open, Woods is right in this through 18 holes. Tags- The Open, Tiger Woods, British Open, Open Championship, The Open Championship 2018, Carnoustie championship course, The Open Championship, the Open leaderboard. 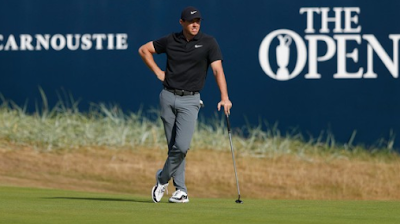 CLEVELAND, Ohio -- Rory McIlroy is grouped with Marc Leishman and Thorbjorn Olesen for Rounds 1-2 of The Open Championship 2018 this week at Carnoustie Golf Links in Scotland. Tiger Woods is with Russell Knox and Hideki Matsuyama. Among other featured groupings: Jon Rahm, Rickie Fowler, and Chris Wood; Jordan Spieth, Justin Rose and Kiradech Aphibarnrat; and Phil Mickelson, Rafa Cabrera Bello, and Satoshi Kodaira. Dustin Johnson, Justin Thomas, Patrick Reed, Sergio Garcia, Brooks Koepka, Brandon Stone, Bubba Watson, Padraig Harrington and Ryan Armour are among numerous other notables in the field. Johnson is ranked No. 1 in the world. He won U.S. Open 2016. Thomas, 25, is ranked No. 2. He has won eight times on the PGA Tour, including PGA Championship 2017. The fiery Reed, 27, won The Masters 2018 -- his first major title. European Tour legend Sergio's first major victory came at the 2017 Masters; a yearlong celebration ensued. Garcia, from Spain, seeks redemption for a playoff loss to Harrington the previous time The Open was held at Carnoustie (2007). Woods, 42, is on the short list of greatest golfers ever. He has been stuck on 14 major victories since prevailing at the 2008 U.S. Open in a playoff against Rocco Mediate. He has played well in fits and starts in the latest iteration of his comebacks. Mickelson, 48, owns five major titles, including the 2013 Open Championship in a shocker. Lefty's performances have been all over the map this season, and his recent disdain for the rules of golf figure to make him chum for the notoriously aggressive European media. Koepka, 28, is the quietest outstanding player the golf world has seen in a long time. In June, he won his second straight U.S. Open. When his wrists are sound, he consistently has been a factor in other majors, too. He is ranked No. 4 (shhhhh). Northern Ireland's McIlroy owns four major titles, including The Open 2014. Even though it seems like he has been around forever, he only is 29. England's Rose, for all his talent, has bagged just one major -- the 2013 U.S. Open. But Rose, 37, has been on the front page of plenty of major leaderboards at some point over the four days. He is ranked No. 3. South Africa's Stone won Scottish Open 2018 last week. He shot 20-under, including 10-under 60 on Sunday. Lefty Watson is the only player with three PGA Tour titles in 2018. He has won two majors (Masters 2012, 2014). Ireland's Harrington successfully defended his Open Championship at Royal Birkdale in 2008. He also won the 2008 PGA Championship. Armour, 42, from Akron, makes his major-championship debut in the midst of a career renaissance. He has earned more than $2 million this season. This is his first-ever visit to Scotland. Spieth, who turns 25 on July 27, won The Open 2017 in a final-day duel with Matt Kuchar. Spieth owns three major titles. Overall, he has not won since The Open 2017. Carnoustie is known for its difficult track, which happens to be baked this year because of a scorching stretch of weather. Expect players to hit plenty of "stingers'' with long irons, so as to keep the ball low and controlled while sending it skipping along the rock-hard pan. Purse: $10.5 million. Winner's share: $1,890,000. Notes: This is the eighth time the British Open goes to Carnoustie. ... For the last three champions at Carnoustie -- Padraig Harrington, Paul Lawrie, and Tom Watson -- it was their first major championship. ... Tiger Woods returns to the British Open for the first time since he missed the cut at St. Andrews in 2015. ... Michael Kim earned the final spot at Carnoustie by winning the John Deere Classic. ... Justin Thomas, Justin Rose, Brooks Koepka and Jon Rahm all have a mathematical chance to reach No. 1 in the world this week. ... Americans in their 20s have won the last five major championships, two of those by Koepka at the U.S. Open. ... Ben Hogan in 1953 is the only Open champion at Carnoustie to have the 54-hole lead. ... The Open has been decided by a playoff the last three times at Carnoustie. ... Harrington in 2007 and 2008 is the last player to successfully defend in the British Open. ... Spieth has not won a tournament since his British Open title last year at Royal Birkdale. Created By Sumon ballav This Pages Author.